Need a durable merchandiser rack that can be customized with hooks, faceouts and baskets? 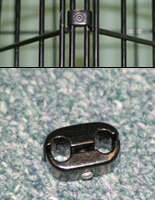 Start with gridwall bases and hardware like these that accommodate one or more wire racks. Available in black and white, these fixtures can come in a number of shapes for setting up different types of retail displays. The gridwall bases and hardware are all made of sturdy metal to last for years and include all the necessary fasteners for installation. 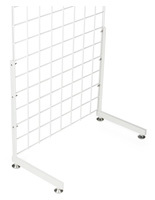 This includes connectors and other accessories that can hold two grid walls together, or keep them attached to stands. 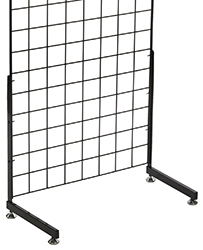 An assortment of gridwall bases and hardware are available for creating a number of different ways to sell goods. What kinds of grid wall accessories are offered here? Gridwall bases and hardware are made in with unique fabrications such as two-sided racks, triangular supports and fixtures that hold (4) merchandiser racks. L-shaped and T-shaped frames can support a single mesh board for a single- or double-sided display. Included on these holders are (4) adjustable floor levelers that allow for maximum stability. In addition, 3-sided triangular gridwall panel brackets will make a great centerpiece for any retail store. These models are a great choice because they include caster wheels for easy maneuverability. Another option is the gridwall panel connectors that allow users to simply connect the racks and create a triangle shape. 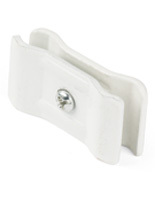 For larger accessory showcases, (4) unit gridwall panel brackets for are sold here as well. These include an H-shaped support and a pinwheel design that both feature caster wheels with a locking function for extra stability. 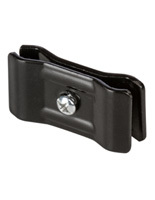 Another type of gridwall panel connector is the wall mounting hook that screws right into vertical surfaces. These simple accessories save floor space because they keep grid walls out of the way. Where can these connectors and floor stands be used? Any retail outlet can use fixtures like these to start building a merchandiser for goods large and small. Convenience stores can utilize them for selling chips, candy, keychains and other impulse items. In clothing shops, the bases and hardware can be paired with hooks and faceouts for holding wares like hats, scarfs and even large shirts and pants. These easy-to-install displays can also be used in supermarkets for merchandising food items and specialty stores for sports memorabilia and toys. All connectors for retail showcases feature quick, same day shipping. The affordable bases and hardware are made of study metal that will last for years. For 1000s of goods with wholesale pricing, shop on StoreFixture.com!